How is Inflation Calculated? As inflation rises, every dollar decreases in value. For example, if the inflation rate is 2% a year, then a $1.00 pack of gum bought at the beginning of the year will cost $1.02 by the end of that year. 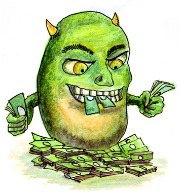 The Inflation Page explains and discusses what causes inflation and how it affects the markets. For many, the easiest way to understand "What inflation is" and how it affects each of us, is to see it, by witnessing it in our everyday lives. The Charts below, are a Visualization of how over the last 40 years or more, "Price Inflation" has affected all of us in one way or another. There are general patterns you will recognize as you view these charts, below are a few questions you may ask yourself as you view them. What is really happening in all of these charts?...Milton Friedman eluded to it in his quote. *Important Note: The prices displayed on all of these Charts are calculated with the average price paid in the United States and are not specific to any brand or region of the United States. 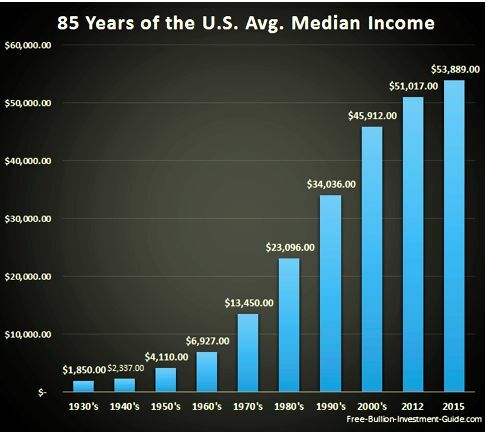 The first inflation chart is the average increase in the Median Income over the last 85 years. Most of the information obtained from the U.S. Census Bureau is based on the average income, a U.S. citizen, earned during the decade indicated. This chart gives you a good idea of how inflation not only affects the items we purchase. But, after you view the rest of the charts below, you will be able to understand that the dollars we earn today are worth less than what they were worth 85 years ago. The next area of interest that affect us all is; what we eat. The next two charts are based on the prices of Bread and Milk. The Milk price below is based on the price of One Gallon of Fortified Whole Milk. 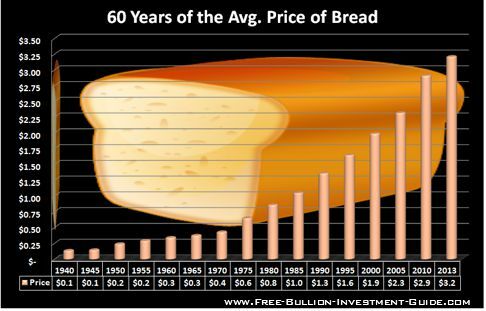 The Bread Price Chart below is the example of the average purchasing price of a 1lb. Loaf of Plain White Bread, in the United States. 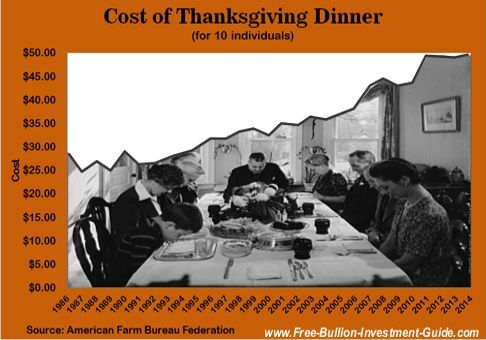 For the American Farm Bureau Federation's "Cost of Thanksgiving" survey was first conducted in 1986. The Survey is an informal gauge of price trends around the nation. However, to allow for consistent price comparisons, the Farm Bureau’s survey menu has remained unchanged, since 1986. 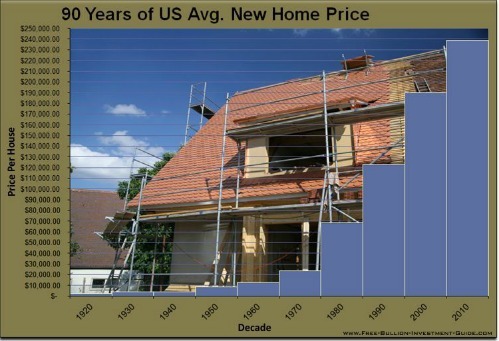 The Prices in this chart are based on the average cost of a New Home built in the United States. 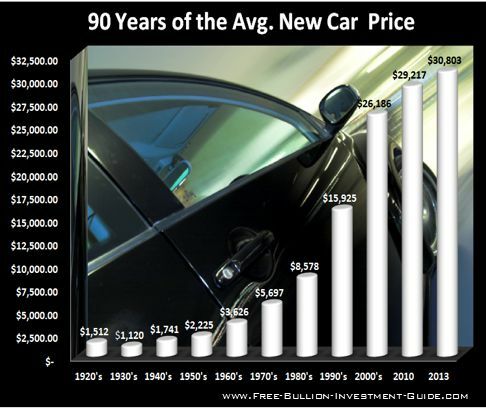 The averages in the New Car prices shown in the Chart below where taken from New Sports cars, Luxury Car prices, New Mid-sized and New Compact Cars sold in the US. 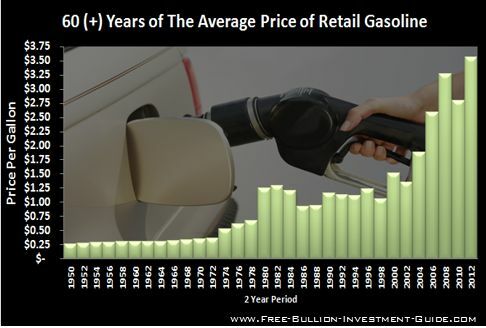 Between 1950 and 1975, the average gas prices are based on a gallon of Regular Leaded Gas. From 1976 to the Present Day, the average gas prices based on a gallon of Regular Unleaded Gas Prices. 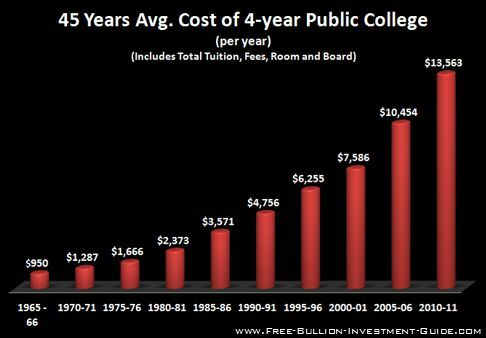 Higher Education has witnessed some of the highest rates of inflation over the years in comparison to other services and commodities. 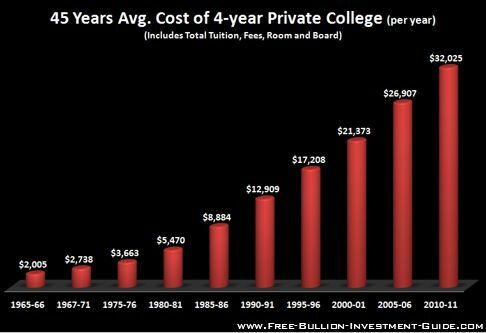 Below are two charts concerning the rising prices of College Tuition. Charts are based on the average undergraduate tuition, fees, room and board rates charged for full-time students in degree-granting institutions. 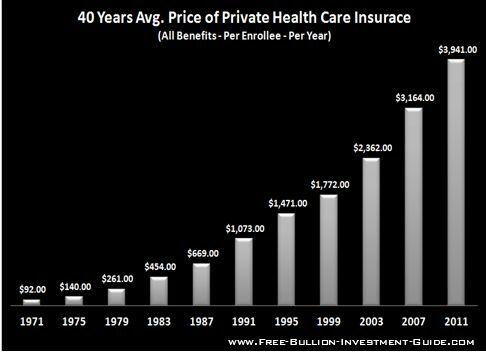 The ACA (Affordable Health Care Act, Obamacare) is not averaged into the charts below, however taking the free market out of any industry and handing it over to the government, is not good for lowering prices. In the next two charts, notice how much more Medicare has increased over the Private Market. 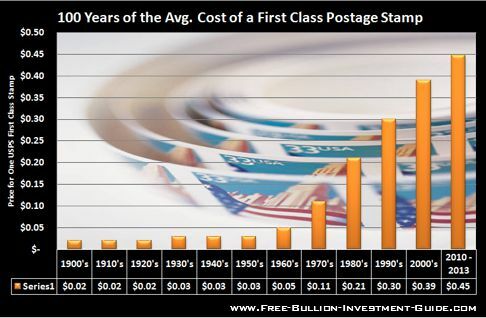 The Prices for the Chart below, are based on the average price of one First Class U.S. Stamp. As with everything else around us, Entertainment Costs have increased in America, too. 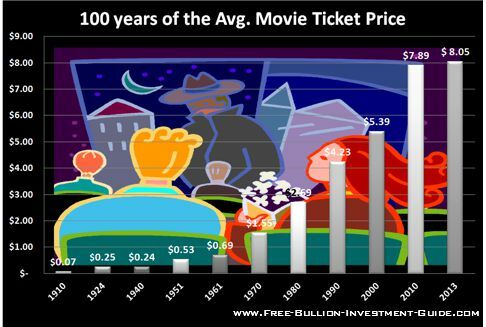 The chart below represents the average increase in the price of a Movie Ticket over the last 100 years. 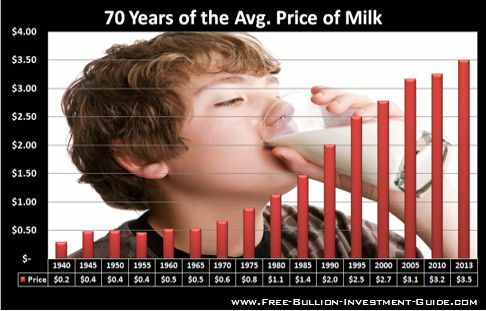 The patterns clearly come into focus after seeing each of the charts, the first is that after the 1970's, Price Inflation literally goes through the roof, compared to the years before the 70's. One Key event happened in 1971, referred to as the "Nixon Shock." The Nixon Shock happened when President Richard Nixon said he would "temporarily" take the United States off the Gold Standard. This action by President Nixon meant that the United States Dollar was no longer backed by gold. Enabling the United State's Federal Reserve to print money so the government could continue to offer more and more entitlements. 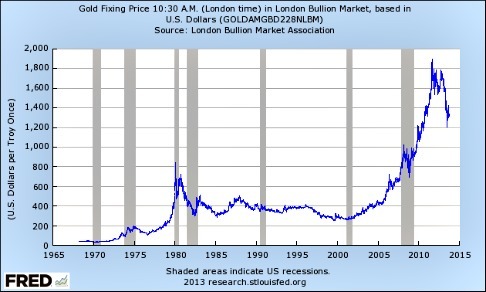 The chart above represents the Price of Gold, over the last 45 years. Compared to all the charts above it, it looks very similar; Don't you think? The other re-occurring pattern that is easily recognizable is Not that the prices of everything around us have gone up, but that the value of our the dollars has gone down. Since the "Nixon's Shock" in 1971, the inflation monster has been creeping into our wallets, eating away at the value of our money. The charts above reveal that Price Inflation has been shedding pennies off our dollars, year over year. In addition, all of the charts above have one overwhelming thing in common, which is, items priced in a currency of expanding supply will constantly continue to lose its purchasing power. Furthermore, gold and other precious metals have retained their value against long term price inflation and that they can help you preserved the value of your money and savings.